In the early 1980's, the impact of drive-in theaters (the former haven of the independent filmmaker) was beginning to wane. However, with this slight loss, there came about a force to truly be reckoned with. This was the mighty home video market. There have been many formats for said market; some of which were Super 8mm reels, Beta tapes, and Laser disc. However, the most infamous and successful was the VHS tape. With their flashy artwork and sometimes enormous boxes, VHS tapes conquered the market and several films that tanked in theaters absolutely thrived on video. The B movies were easily the champions of this world, as the major studios had few titles released on video due to piracy fears. However, out of this explosion of profit came a new breed of filmmaker - people with little money that would film their cinematic dreams on VHS itself - this was the shot on video filmmaker. Though the format was not initially met with much enthusiasm, these films made a definite impact due to the box art being able to fool unsuspecting video renters as to how the final product looked (a factor that is lost today even with big budget films). These artists were normal, average people you might run into on the street, burning with passion to make their films even though the budgets rarely exceeded a few thousand bucks. Initially, there were only a few mass released films shot on this format, and the only one to get a theatrical release was the original S.O.V. film - BOARDINGHOUSE. After this film came SLEDGEHAMMER and BLACK DEVIL DOLL FROM HELL. However, 1985's BLOOD CULT was a smashing success on the video rental and found itself into about every video store you could come across (even appearing in Blockbusters nationwide long after its heyday), and practically set the chain in action good and proper. After this, you might find yourself with films like BLOOD LAKE, CANNIBAL CAMPOUT, TWISTED ILLUSIONS, DEMON QUEEN, VIDEO VIOLENCE, PHANTOM BROTHER... the list goes on and on. In age where people refer to films with 20 million dollar budgets as "independent films", the SOV library laughs at the notion, for they are the true independents, and they prove that you don't need millions of dollars, famous actors, huge, spectacular pyrotechnic effects, or 35mm film to make a perfectly entertaining, effective, even well made and acted movie. 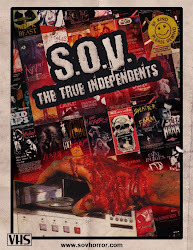 S.O.V. : The True Independents, shot on glorious VHS itself, tells the story of those hard-working individuals who slaved over their camcorders day and night to come out of the jungle with a finished film in their hands. 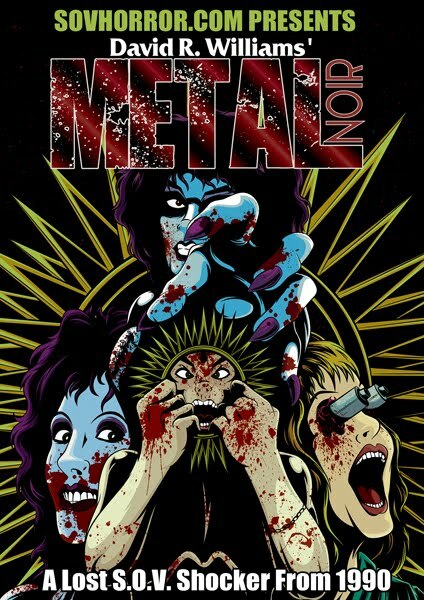 It is the ultimate treat for any fan of this shunned and misunderstood, niche sub-genre of horror, with behind the scenes anecdotes and post-production tales straight from the filmmakers themselves. This wonderful web series is currently in production by Number Signs Productions' Tony Masiello, a man who has worked on several low budget horror films including (FRAMES OF FEAR, SLEEPLESS NIGHTS, RETURN TO THE QUAEDEAD ZONE) and even several Hollywood blockbusters (which include HUGO and MAN OF STEEL). He is making this web series as a love letter to the sub-genre that inspired him to break into this industry, with the help of fellow camcorder zealots Brandon Bennett and Matt Hill. Get Ready... LIGHTS... CAMCORDER... SPLATTER!!! If you feel you can help out in any way please contact us.